A measure of the presence, function and economic value of arbuscular mycorrhizas is proposed as a potential indicator of soil health. The roles of hyphae in soil include enhancing the efficiency of plant access to nutrients, especially phosphorus, facilitating plant access to water under water-limiting conditions, protection of soil organic matter, and strengthening resilience against disease. As such, mycorrhizas can influence economic benefits through their direct and indirect effects on plants associated with chemical, physical and biological components of soil fertility. Although the presence of mycorrhizas is pivotal to many soil processes, their potential contributions can be overridden by soil management decisions that do not take them into account. Nevertheless, it is difficult to quantify the economic benefits of mycorrhizas in agricultural ecosystems. Risk minimisation strategies can be used to deal with some or all of the factors that impede realistic economic valuation of mycorrhizas. 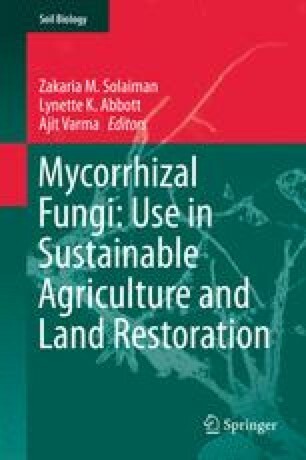 However, without even rudimentary local knowledge of arbuscular mycorrhizal fungi in agricultural ecosystems, there is potential for management practices to fail to consider fully, and consequently fail to capture, benefits from these widespread and potentially beneficial soil organisms especially if their contribution is difficult to quantify.